It has been an interesting summer so far, with plenty of attention on the World Cup; the return of LeBron James to Cleveland, and the possibility of a deal for Kevin Love; and all things Johnny Manziel as the Cleveland Browns work their way through training camp. The Cleveland Indians have pretty much just been an afterthought, sitting on the periphery of Cleveland’s collective sporting conscience with a .500 record. But take a closer look at the standings in the American League and, heading into Tuesday night’s game against Cincinnati, we realized that the Tribe is just 2.5 games out of a Wild Card spot. We’re not sure how they are doing it, but manager Terry Francona once again has the Tribe in the race for a playoff appearance. In light of this surprising development, it seems like a good time for a quick Thumbs Up/Thumbs Down on the Tribe so far. Thumbs up, Corey Kluber: Kluber has quietly put together an impressive season. He hasn’t lost since June 30 (a 1-0 defeat to the Dodgers) and has gone 3-0 while posting an ERA of 0.79 in four starts since the All-Star break. 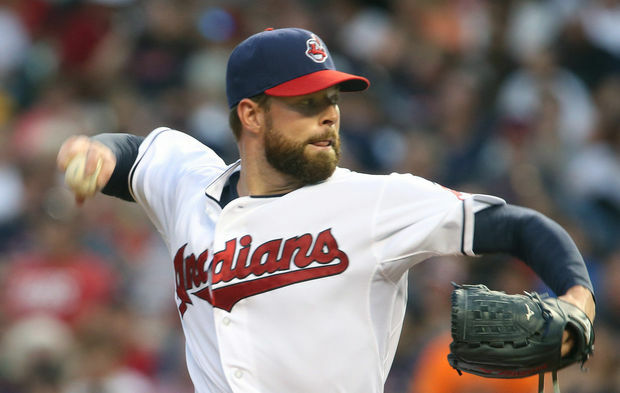 Over his past eight starts, Kluber has a 6-1 record, striking out 63 in 62 innings of work. According to ESPN Stats & Info, Kluber has allowed a .077 hard-hit average in at-bats that end with a curveball this season – the lowest among qualified starters to end at least 30 plate appearances with the pitch. Thumbs down, the rest of the rotation: Justin Masterson is gone, traded to St. Louis last week after posting a disappointing ERA of 5.51 over the first four months of the season; Trevor Bauer and Danny Salazar have been inconsistent; Josh Tomlin and Zach McAllister have kept the shuttle between Cleveland and Columbus busy; and T.J. House is a nice pitcher – for a fifth starter in the rotation. For the Tribe to make a serious run at the playoffs, they are going to need a couple of starters not named Corey Kluber to put up the type of season-ending streak they received last year from Scott Kazmir and Ubaldo Jimenez. Who among the group is capable of doing that remains a mystery. Thumbs down, Nick Swisher: The Tribe’s $15 million man is currently day-to-day with a wrist injury, quite possibly from striking out so much (106 times so far this season). Because of his contract, the Tribe is stuck with Swisher for three more years after this season. By the time he leaves town, Swisher will join the likes of Wayne Garland and Keith Hernandez on the list of worst signings in franchise history. Thumbs up, Carlos Santana: The Opening Day third baseman and current first baseman, Santana was almost as bad as Swisher for the first few months of the season. 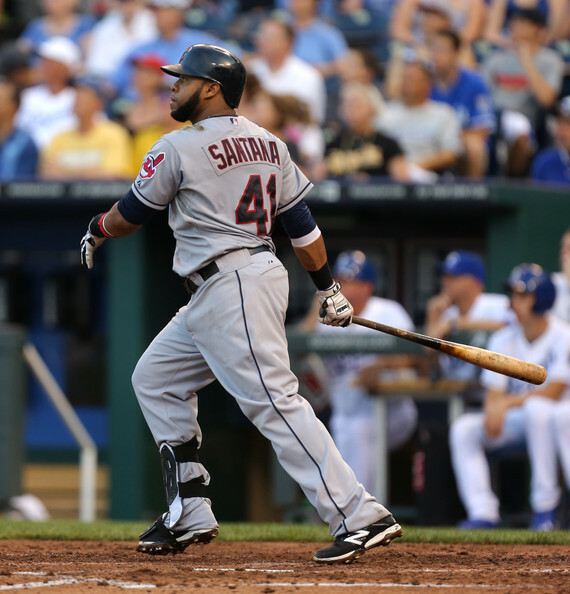 Through the end of May, Santana batted just .159, with six home runs and 17 RBI. But since June 1, he has batted .306, hitting 14 home runs to take over the team lead, and adding 36 RBI. He is now tied for second on the team in RBI, first in walks, second in on-base percentage and third in OPS. Now that’s how you bounce back from a slow start to the season. Thumbs up, Cody Allen: The Tribe’s closer has 14 saves on the season, is dominant against left-handed batters, who are hitting just .125 against him with an on-base percentage of .184, and has settled down the backend of the bullpen after John Axford struggled in the closer’s role to open the season. 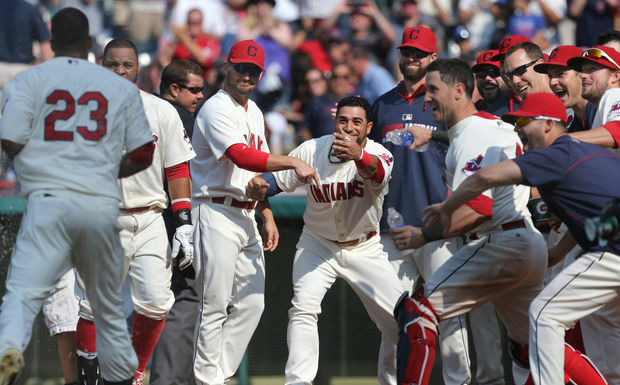 Thumbs up, watching the game on TV: The Tribe has been the top TV draw across Northeast Ohio this season, averaging a 6.73 rating, roughly about 100,000 households, during the evening hours. They also own the fifth-best local TV ratings among all Major League teams. (h/t Waiting for Next Year). Thumbs down, watching the game in person: The Indians are currently 29th in the majors in attendance, averaging just 18,596 fans per home game. They are playing in front of crowds that fill just 42.8 percent of Progressive Field’s available seats, the lowest percentage in the majors. We’re still not sure how they are doing it, or if the Tribe can even keep on doing it, but for now we’re going to enjoy it while it lasts. Because while Cleveland is certainly not a Tribe Town, that doesn’t mean we can’t have another Indian Summer.